Went out to the Lake to try and shoot something flying or flapping but this Swan was posing around up stream with the cooling system open and operative for all to see... Well, how could I refuse. Shot in RAW opened in photoshop, curves, square cropped, lucisarts filter applied, curves again, selective colour on neutrals, blacks and whites, some dodging/burning around the wings and in the water, noise ninja, resized, noise ninja again for contrast boost, border, submitted. I just stumbled upon this simply amazing entry and it leaves me speechless by its beauty. Told you already, man...I love this shot!! AMMMAAZZZZING PHOTO!!!!WOOOW! I'm in AWWWEEE! BRAVO!!! got to add this to my faves..
Holy mackarel this is impressive. Excellent detail in the feathers - not an easy task with white. Impressive shot!! This is magnificent! I love the tweeking results too, you obviously know what you are doing with PS. Would you mind posting the original? Wow! Pretty incredible photograph, congratulations! Just looking at your Profile: while this is not a black and white...it's general tone is the very Zen palette - all four of your top 4 images have the appearance of B+W. Nice!!! Just a fantastic photo which I knew in my inmost pap to be yours. Congratulations. 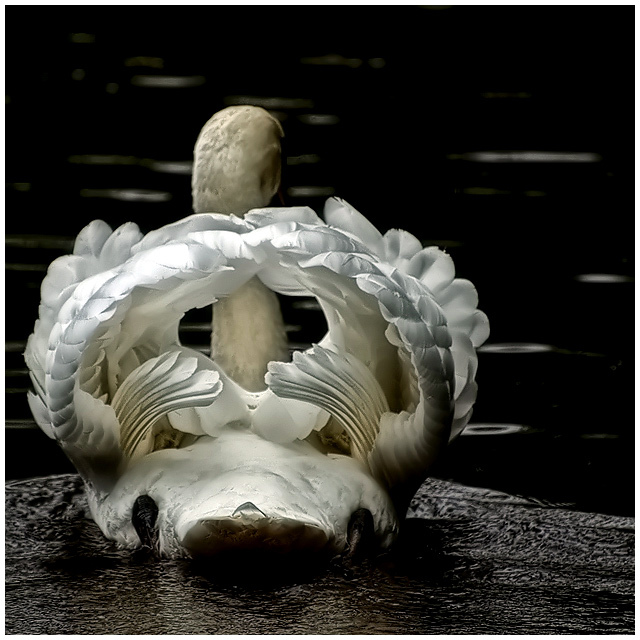 My apologies - I saw the image small, thought how clever of you to have put a sort of olympic laurel wreath on the swan, opened up to see the join, and voila - it's real feathers! I am so impressed - I have photographed lots of swans on my local park lake, but never got such a lovely view - and the shading an shadowing show off the feathers and space round them just so perfectly. My pick for the blue, what a perfect capture for the challenge, nice processing too. Congrats! Such an amazing capture!! Congrats on the Red Ribbon!! KILLERRRR good shot, swan with a difference! Love it! Wonderful texture and detail in those wings...congratulations winning the red ribbon! Perfect capture. Congratulations on your ribbon. Very nice, when it comes to wings these are very unique and well done. Beautiful picture! One thing that bugs me is the crop..why the crop to the side? Thanks.. I tried it center but it just did not look right to me, this was the better crop as I think it gives the swan a place to go to, a space to move into... Just my personal feeling. Congratulations on the ribbon and on beating your personal avg yet again :) I'm in awe of the design and symmetry of the wings. Great capture. lighting is just a couple nanometers shy of perfect, but I'll put that down to the fact that your model doesn't speak your language and wasn't being fed M&M's with the green ones removed (I've heard that some models can be VERY finnicky). A seriously memorable shot I'd say. something I've never seen in the wild... or the park. Great capture, a well-deserved dream score. Congratulations on the ribbon. One of my fav's during the challenge! And I was wrong about my comment. Congratulations on your 2nd place! Way to go Marac. You knew it was going to happen from the beginning of the voting. Congratulations on your ribbon. It is well deserved. Congrats on achieving your dream score, Marac; it's a terrific shot all right. Marac, congrats on the red! I love this shot! Congrats Marac, stunning shot, never have seen a swan pose like that. WTG MAK!!! Congrats on your well deserved place with this beautiful shot! Exquisite - I'd love to see this maneuver in person - it's gorgeous! did very well mak! congrats, its very different. Incredible "pose" Marac; Congratulations on Red! Congrats on the red! Beautiful photo! Dream score it is! Well done Marac! Congratulations. I LOVE the detail in this. What a really stunning image. Congrats on your great finish. Simply Stunning and my choice for the blue. I'm surprised it didn't get it. Fabulous score though. I bet your bouncing off your seat! Dude, you just keep getting better. Congrats on getting your dream score! Outstanding! Congratulations on a great finish for a gorgeous photo. You got your dream score :) Congratulations, you deserve it! Glasseye is going to be good! Message edited by author 2007-08-27 00:22:17. There needs to be a rule that you can only have one Glasseye member on the same front page. Oh and quit stealing the Austin talent! And congrats on the ribbon. MAK!!! I can't believe mine jumped ahead of yours in the last moments of the challenge! Yours was ahead all week! Course you know how I feel about THIS photo! I just can't believe we actually are both side by side on the front page!! And you did get your dream score! I'm so proud of us!!! This was my favorite shot from the challenge. Congratulations on a well-deserved ribbon! Absolutely stunning - and I love the editing. Congrats on the red, MAK! Great capture. I told you first in the scores thread ! Congrats, I had a feeling this one would make home page. Hey, wow, MAK! Congrats on a beautiful shot! This is so beautiful it is almost hard to believe it is a real swan. Can't wait to read your description. Great shot. That is very cool. Is it an actual photo of real behavior, or is some editing involved? This is amazing! I love the contrast and the texture. well done! I give this a 10! I love the composition, but I feel it a little dark. I understand the underexposure to preserve the highlights, though. DOF is a little too shallow. Overall I like this picture a lot anyway. Wow, great capture, from the thumbnail, I didn't think it was real, focus point is right on, lighting is great, 10. What a wonderful subject and a nice capture. 8 for wings! The more I look at this, I think it has a Sandy P feel too it. I may be wrong. Coming back to bump to 10 - the BEST in the challenge! The HDR feel is just gorgeous and the unconventional view of the bird just presents so powerfully the "Wings" idea. What a great capture. Your title just brings it all together: Anna Pavlova would have been smitten! This is SO beautiful! I wish the wings could have formed a little heart right there in the center! Almost! Beautiful capture of the wings. Too bad the head was not turned to the side to get the completeness of the swan. I've never seen wings do that before. Very pretty with the lighting. WOW this is a beautiful capture. The wings are beautiful. I don't care much for the rest of the shot. The black water looks so dirty, as does the swans tail. Wow, this is crazy! Is the swan really doing that with its own wing? Is it a real swan? This is gorgeous. I love delicately ruffling feathers. I think you might win, simply on grounds of originality (at least, I've never seen this shot before) and of control of exposure. Its very pretty, this; a bit too much so for my taste which is for the more difficult, but in its way, faultless I think. Neat capture!! Nice timing with that shutter button. Wow, stunning, the tones and the glow of the feathers are beautiful.....10. What a cool perspective. Great timing to get that odd placement of the wings. Very distinctive. i have only looked at 30% of the shots, but i will be shocked if this is not a ribbon. AMAZING SHOT!!!!! If i could give more than a 10 i would, it's just jaw droppin' awesome, i love it. Wow...unusual position, although I'd go for a little more highlight on the swan to constrast with the black water. Great shot, though. wow! I have never seen it before! Great captured! Oh, this will easily take the blue. Congratulations! WOW!!! This is just magnificent. We used to raise swans when I was growing up - you've captured their beauty so well. I love the dark moody tones and unusual POV. This is a masterpiece. 10! This really is the jewel of the challenge. Best of luck - an inspiration to all!!! Wow. Verrry cool. What a fantastic capture. Proudly hosted by Sargasso Networks. Current Server Time: 04/19/2019 12:37:58 PM EDT.